UCSB Reads is an award-winning campus-wide and community-wide “one book” program started by the UCSB Library and Executive Vice Chancellor Gene Lucas in 2007. Each year, a committee of faculty, staff, students, and community partners convene to select an intellectually stimulating, interdisciplinary book by a living author that appeals to a wide range of readers and can be incorporated into the UCSB curriculum. The program kicks off on at the start of the winter quarter with the Chancellor, Executive Vice Chancellor, and University Librarian distributing free books to UCSB students in the Library. A variety of UCSB Reads events (book clubs, film screenings, exhibitions, and faculty panel discussions) exploring the book and its themes are held on the UCSB campus. The program culminates in a live appearance by the author. Events are generally free and open to the public. 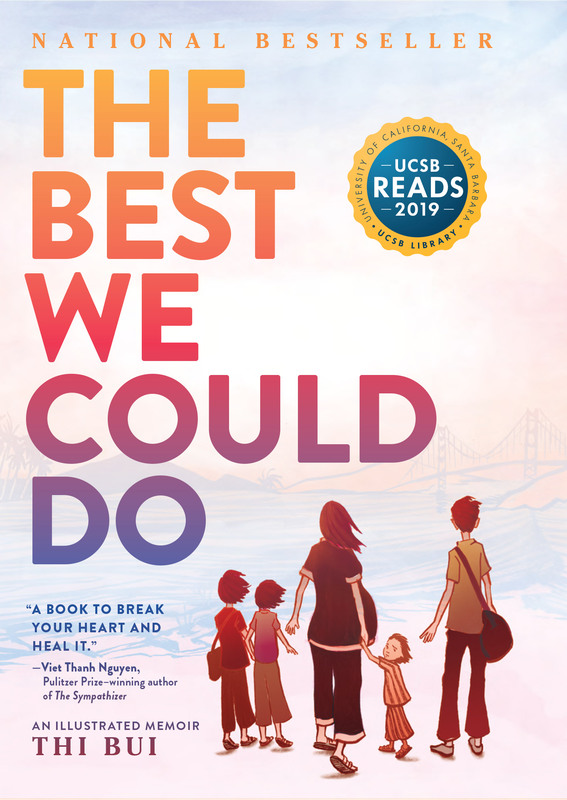 In 2019, we will be reading The Best We Could Do" by Thi Bui. Learn more about UCSB Reads 2019. Click here to subscribe to our e-newsletter and have information about upcoming UCSB Reads events delivered directly to your inbox. To suggest a UCSB Reads 2020 title please use our online form. Chancellor Henry Yang distributed free copies of the UCSB Reads 2018 book, "Lab Girl" to UCSB students in the Library. Author Hope Jahren joins students from the College of Creative Studies as they celebrate the final day of UCSB Reads 2018. UCSB Library staff give students attending the author talk a First Edition UCSB Reads T-Shirt.